Episode one, "Space Pilot 3000", is aired on FOX. 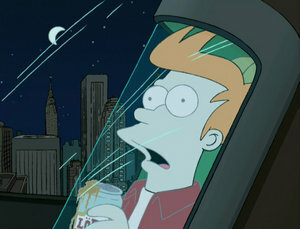 It is the pilot episode of Futurama and the first episode of season 1. Episode two, "The Series Has Landed", is aired on FOX. Episode three, "I, Roommate", is aired on FOX. Episode four, "Love's Labours Lost in Space", is aired on FOX. Episode five, "Fear of a Bot Planet", is aired on FOX. Episode six, "A Fishful of Dollars", is aired on FOX. Episode seven, "My Three Suns", is aired on FOX. Episode eight, "A Big Piece of Garbage", is aired on FOX. Episode nine, "Hell Is Other Robots", is aired on FOX. Episode ten, "A Flight to Remember", is aired on FOX. Episode eleven, "Mars University", is aired on FOX. Episode twelve, "When Aliens Attack", is aired on FOX. Episode thirteen, "Fry and the Slurm Factory", is aired on FOX. Season 1 finale. Episode fourteen, "I Second that Emotion", is aired on FOX. Season 2 premiere. Episode fifteen, "Brannigan, Begin Again", is aired on FOX. Episode sixteen, "A Head in the Polls", is aired on FOX. Episode seventeen, "Xmas Story", is aired on FOX. This page was last edited on 28 March 2014, at 23:00.